In typical Shaun fashion, he wasn’t content with just finding the best deal on the requested calculator. Nope, my husband wanted only the best for his Darling Daughter and found a calculator that he felt would meet her needs better. So he sent her an email outlining why it was better and asked what she thought. KT was terribly confused as to why her father wanted to get her a new calculator because she already had a perfectly good one and even considered it one of her best friends. (Seriously, if either of my kids had been born in a hospital I would be convinced that they had been switched at birth. Best friends with a fancy calculator of all things? They certainly didn’t get that from me.) Apparently, even though I knew which Darling Daughter needed new supplies, Shaun didn’t. This afternoon, Mimi once again mentioned that she needed a calculator for the next day. My heart sunk. I had completely forgotten about it, and as a thirteen year veteran of buying school supplies, I knew that we might be in for some trouble. I learned long ago that supplies need to be purchased as soon as they come out in August. If you are foolish enough to wait until the school lists come out, the shelves will be nearly striped clean and you will be forced to wander from store to store searching in the dark barren shelves and floors for stray supplies. I dropped Mimi off at soccer practice and bravely went hunting. When I came to the empty aisles where the calculators should be, my hopes were lifted when I read a sign that said it was “locked merchandise” and to find a sales person. To my surprise, I quickly found a very helpful young lady who, upon consulting with her hand-held stock checker thingy (I know, it’s a highly technical term, work with me here) let me know that they were completely out of stock in every color. Then she offered to use her stock checker thingy to see if any other stores in the area had some in stock. She found one calculator in stock at the very edge of a 50 mile radius. I sighed and asked if she would please see if they would hold it for me. We were too late, it had just been sold to someone else. Instead of driving all over town on my quest, I decided to call the closest office supply store. I nearly fell over when the clerk casually informed me that they had lots of them in stock. I was even happier when he mentioned that they were even on sale…that was until I realized that the sale price was over twenty dollars more than price at the store I had just left. The cheapskate in me Something made me ask if they matched lower prices from another store. I was giddy when he said they did, all they needed was proof. Hmmm…I wasn’t sure how I was supposed to prove the lower price, so I marched back over to the empty calculator aisle and used my handy dandy phone to take a picture of the price tag at the first store. I have to admit that the clerks at the office supply store looked at me a bit incredulously when I showed them the price on my phone. Apparently nobody had ever thought to do that before. 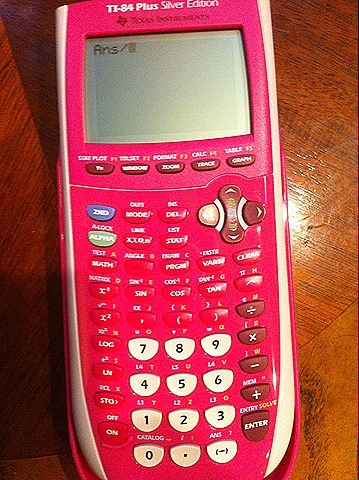 After a lot confusion and frustration, Mimi is finally the proud owner of a beautiful hot pink super fancy calculator. This entry was posted in Adventures, Humor, Mimi, Random stuff, Teens and tagged calculaters, cheap, frugal, internet shopping, school supplies, TI-84. Bookmark the permalink. Oh yeah.. Mom to the rescue. I hear what you’re saying though. Spending that kind of money on a calculator would irk me too. I’ve become convinced that (just like college text books) those graphing calculator prices are a scam. Not that I got out of buying one when I needed it (used on ebay). 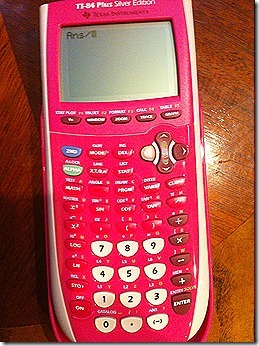 Fie on you, Texas Instruments, I say fie. If someone is smart enough to figure out how to use one of those calculators, then they are probably smart enough to do all the work without one. I have the answer for you–Vegas, baby! My husband travels there for work and for some reason the pawn shops have a lot of scientific calculators. All four of our kids have needed those and he gets them for about $40. Crazy, but true. I guess not everybody that’s smart enough to know how to use the calculator is also smart enough not to use his/her shirt in Las Vegas! What an odd thing to just happen to have with you to pawn. That is completely crazy how you need to spend so much on something that is a necessity in school. We had ours provided unless you wanted to get your own, especially if they were making it mandatory to use one! I think they do have a classroom set. Only you can’t check them out to do homework with. I remember in the early 70s when the first true calculators hit the market. My husband (ex) had to buy one for his engineering class. It was somewhere around 4 or 5 hundred dollars. More than I was making a month at that time. It was a tough purchase.